the guidelines, rules and regulations issued by the Department of Budget and Management (DBM). grant of the U/CA to civilian personnel. contracts of service, and others similarly situated. 5.2 Serve as protective or working clothing; especially for maintenance, workshop, and farm personnel. pertinent general provision in the annual GAA. 6.2 The U/CA per annum for part-time service shall be in direct proportion to the U/CA for full-time service. 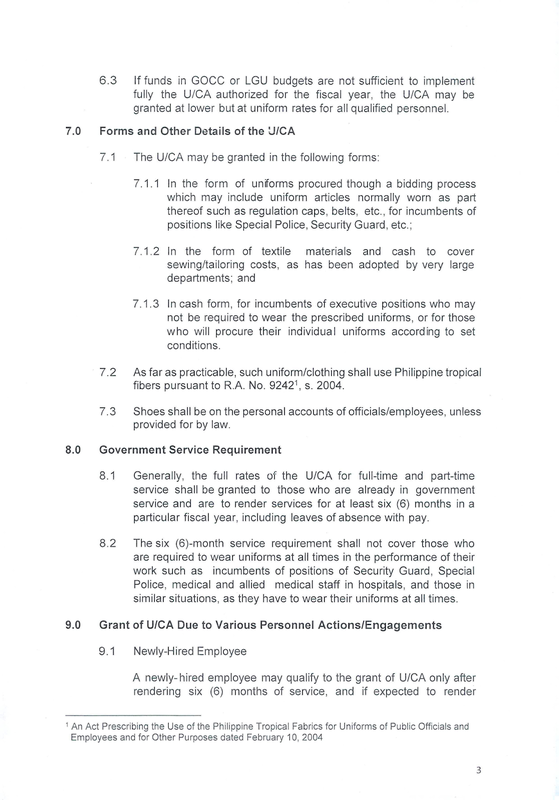 6.3 If funds in GOCC or LGU budgets are not sufficient to implement fully the U/CA authorized for the fiscal year, the U/CA may be granted at lower but at uniform rates for all qualified personnel. 7.1.3 In cash form, for incumbents of executive positions who may not be required to wear the prescribed uniforms, or for those who will procure their individual uniforms according to set conditions. 7.2 As far as practicable, such uniform/clothing shall use Philippine tropical fibers pursuant to R.A. No. 92421, s. 2004. 7.3 Shoes shall be on the personal accounts of officials/employees, unless provided for by law. 8.1 Generally, the full rates of the U/CA for full-time and part-time service shall be granted to those who are already in government service and are to render services for at least six (6) months in a particular fiscal year, including leaves of absence with pay. 8.2 The six (6)-month service requirement shall not cover those who are required to wear uniforms at all times in the performance of their work such as incumbents of positions of Security Guard, Special Police, medical and allied medical staff in hospitals, and those in similar situations, as they have to wear their uniforms at all times. 9.1 Newly-Hired Employee A newly-hired employee may qualify to the grant of U/CA only after rendering six (6) months of service, and if expected to render services for at least six (6) months for the rest of the year. 9.2 An Employee on Detail The U/CA of an employee on detail to another government agency shall be borne by the mother agency. 9.3.1 An employee who transferred to another agency and was not granted U/CA by the former agency shall be granted U/CA by the new agency, subject to the submission of a certification to that effect. 9.3.2 An employee who transferred to another agency within the year but was earlier granted U/CA by the previous agency shall no longer be granted U/CA by the new agency. 9.3.3 An employee who transferred to another agency and is required to wear uniforms at all times, may be granted U/CA by the new agency even if he/she was granted U/CA by the former agency, subject to the approval of the new agency head. 9.4.1 An employee on study leave or on study/training/scholarship grant locally or abroad shall be entitled to the U/CA for the year if he/she renders at least six (6) months of service in the same year, including leaves of absence with pay, prior to and/or after the study leave or study/training/scholarship grant. 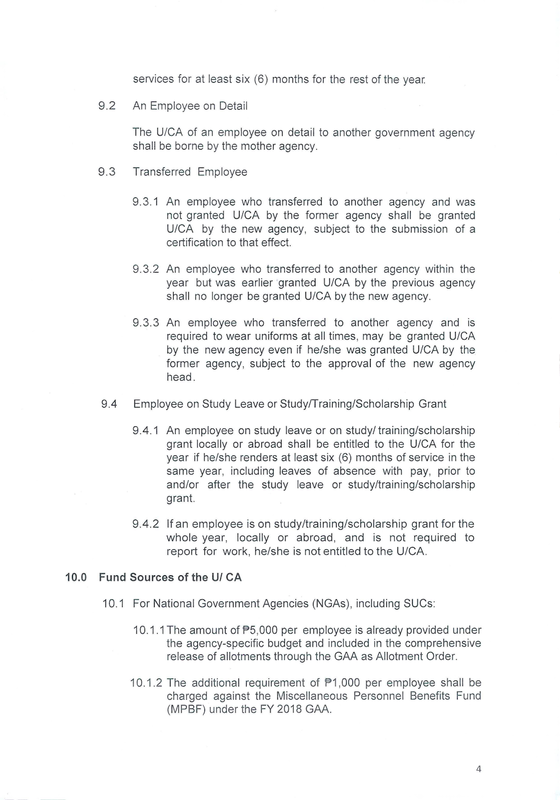 9.4.2 If an employee is on study/training/scholarship grant for the whole year, locally or abroad, and is not required to report for work, he/she is not entitled to the U/CA. 10.1.1 The amount of P5,000 per employee is already provided under the agency-specific budget and included in the comprehensive release of allotments through the GAA as Allotment Order. 10.1.2 The additional requirement of P1,000 per employee shall be charged against the Miscellaneous Personnel Benefits Fund (MPBF) under the FY 2018 GAA. 10.2 For GOCCs, the amount required shall be charged against their respective approved corporate operating budgets. 10.3 For LGUs, the amount required shall be charged against their respective local government funds. 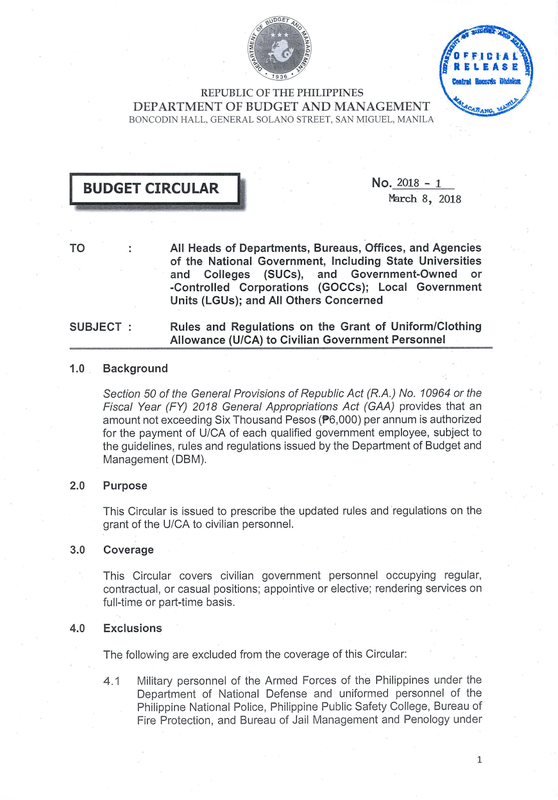 The grant of U/CA in LGUs shall be subject to the Personnel Services limitation in LGU budgets pursuant to Sections 325(a) and 331(b) of R.A. No. 7160 or the "Local Government Code of 1991." 12.1 They shall issue internal guidelines on the grant of the U/CA such as, determination of the form of U/CA, and selection of uniform/clothing designs. 12.2 They shall also issue internal guidelines on: the prescribed uniform or clothing for specific or special employee groups; modified uniforms as may be necessary due to religious affiliations or creed, •physical disabilities, or legitimate health reasons; and monitor compliance with set guidelines on wearing uniforms and appropriate attire. 12.3 They shall be held liable for any grant of U/CA not in accordance with the provisions of this Circular without prejudice, however, to the refund by the employees concerned of any excess or undue payments. 13.0 Resolution of Cases Cases not covered by the provisions of this Circular shall be referred to the DBM for resolution. 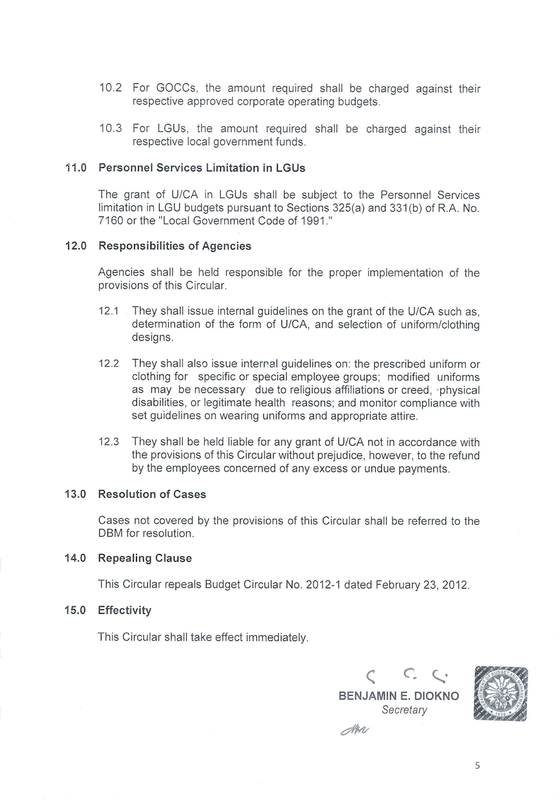 14.0 Repealing Clause This Circular repeals Budget Circular No. 2012-1 dated February 23, 2012. 15.0 Effectivity This Circular shall take effect immediately.